I think 'Orpheus Feeling� is a great album and it is very strange that nobody knows it. If I play it to people they indeed always refer to the Doors, but I think KOI have a sound of their own. Not every band with en deep voice and an organ is a Doors-clone. I first heard it from the singer of a band that I used to play in (called Gumbrains). He is the only person in the world I know who knows KOI. I recorded the album on a cassette, and I still like it. And okay, it�s good when some mysteries remain in pop music. The debum KOI album. 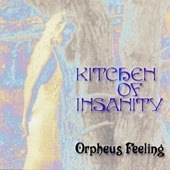 I got it after the band came to attention and got more airplay with their second outing, Orpheus Feeling. Although the latter is far more sophisticated, this debut has its own strength; mixing rock, blues, classical influences,... It�s all pretty much there... All very straight forward. Also look for the TIME cd maxi single. This one holds two more songs that are not te be found on the two KOI albums! Saw them at the Humo�s rock rally final. They were second after Noordkaap. Really great band. Paul is now playing in "Drunken Maria". But they didn�t release an album yet. 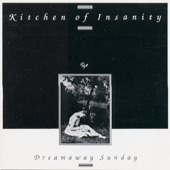 I saw Kitchen of Insanity in the beginnings of the 1990th in Regensburg/Germany. It was a great experience. I never forgot it. The voice of Paul de Borger is wonderful. giant band opgericht begin jaren 90 Dreamaway sunday is een droomplaat Oorspronkelijke bezetting met Frank , Paul , Michel , Jan en Stefan geweldige periode - geweldige optredens notalgie ten top 2e plaats rockrally wanneer reunie ??? ?